Amazingly, GTA Online has been running for over five years now, and Rockstar's multiplayer juggernaut is showing no signs of slowing down. Things have come a long way during that time, and players who started out jacking cars and making deliveries can now take charge of a whole criminal empire - running elaborate heists, arms trades, drugs distribution, and much more from a huge military bunker deep underground. It's still so popular that despite being one of the biggest releases in 2018, Red Dead Online is making a hell of a lot less money than GTA Online, and with a loyal fan base still regularly plugging away it looks like this isn't going to change any time soon. GTA Online patch notes - what's new in GTA Online? The online world is constantly evolving, with new features and modes still being added all the time. Check out the latest GTA Online patch notes and you'll always know what the latest updates are. The world of GTA Online is huge, and if you're not familiar with it then the prospect of heading in unprepared can be pretty daunting. Fear not though, as we have a complete guide on how to play GTA online, including top tips for all GTA Online players to help you on your way. 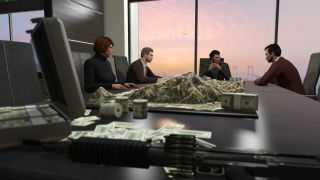 Money quite literally makes the world go around in GTA Online, and if you want to do most of the cool stuff then you're going to need to invest some serious virtual dollars to access it. If you don't want to spend real money, then follow our guide on how to make money fast in GTA Online. As you work your way up to Rank 100 and beyond, various weapons, customisation items and more will unlock. This can be a long process, so check out how to level up fast in GTA Online so you can speed things up. There are plenty of different missions you can undertake in San Andreas, with varying degrees of reward for your troubles. If you're after a fast buck then get stuck into the GTA Online best paying missions. If you want to take the chequered flag in some high stakes GTA Online races, then you need to be driving the fastest car you can get your hands on. But what are the GTA Online fastest cars, you ask? We've tested every supercar to give you an exact answer, using science. Thanks to the Rockstar Creator, there are a huge number of user created races available to take on. We've sorted the wheat from the chaff to recommend the GTA Online best races. Gunrunning can be a great way to earn money and upgrades, but it's also tricky to get in to and requires careful investment to turn a profit. Follow our GTA Online Gunrunning guide to get the most out of it. Visit any Ammu-Nation store in-game and you'll find a massive selection of guns, explosives, and melee weapons to choose from. We've selected loadouts of the GTA Online best weapons for different situations, so you always have the right tools for the job. If you've been running a nightclub as part of the After Hours update, then you should be accruing cash in your GTA Online nightclub safe. However, it can be tricky to actually find and collect your earnings as it's well hidden in a wall, so follow our guide to locate it. If you want to shortcut to those virtual dollars then you can buy a GTA Online Shark Card to top up your bank account - we've investigated which one gives you the best value, and what you can buy with it. Since GTA Online first launched some five years ago, there have been over 30 significant updates that have radically evolved the online world. We've charted all of these GTA Online updates, with help from Rockstar’s director of design Imran Sarwar. To track down the Double-Action Revolver in GTA Online, as well as unlocking it for Red Dead Redemption 2, you'll need to receive an in-game email that kicks off a treasure hunt across San Andreas. If you're having trouble with any of the stages, then here's how to get the Double-Action Revolver in GTA Online. The Stone Hatchet is another weapon you can unlock in GTA Online, and also have available once Red Dead Redemption 2 launches. To get started, you'll need to receive texts from Maude sending you off on a series of bounty hunters before the location is revealed, to help out we have a complete guide for how to get the Stone Hatchet in GTA Online. You may have seen other GTA Online players sporting a cool Kifflom t-shirt from the Epsilon Program, and wondered where they got it from as you can't purchase it in the game. The method for receiving it is somewhat convoluted, and involves drinking lots of expensive whisky in nightclubs and passing out - for full details, here's how to get the Kifflom t-shirt in GTA Online. Perhaps after all that you're looking for a different challenge? If so, then there are plenty of other games like GTA you can check out instead.